Would you be interested in being a part of The Ubele Initiative’s delegation for Yo! Fest 2018? Yo!Fest is the annual youth political festival organised by the European Youth Forum which acts as the youth voice for the European Parliament . Yo! Fest 2018, is a groovy combination of politics, debates and workshops with live music and a variety of artistic performances, creating the perfect mix for an enjoyable and meaningful experience. This year Yo! Fest will be held in Strasbourg on the 1st & 2nd June. We will leave London and travel by Eurostar to Strasbourg on Thursday 31st May 2018. The Ubele Initiative will be taking a delegation of 20 young adults aged 18 -30 years from across the UK to Yo! Fest. Our delegation will be a part of ‘Working out for a Stronger Europe Hub’. 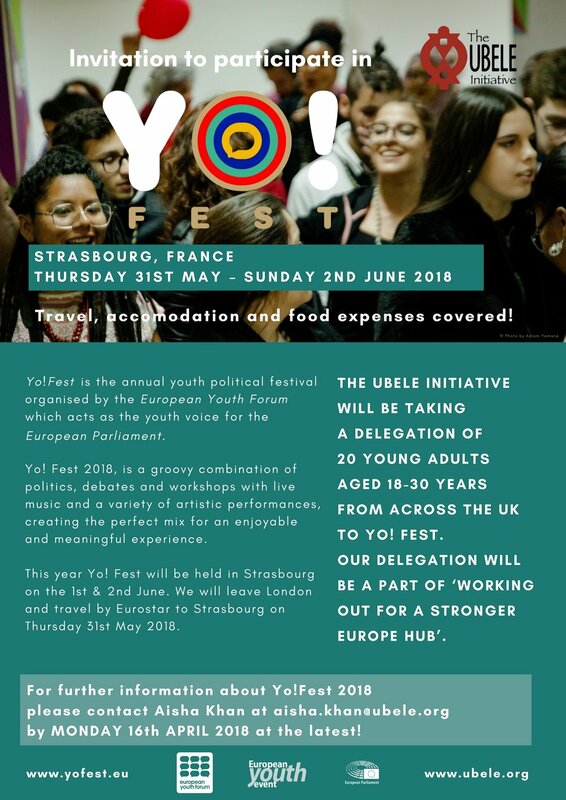 For further information about Yo!Fest 2018 please contact Aisha Khan at Aisha.Khan@ubele.org, by MONDAY 16th APRIL 2018 at the latest!